After a long wait, the Opcode Club is getting closer to become a reality. The final and main component, the magazine, is now in good hands. Jess Ragan is the editor, while Off Base Productions is taking care of design. I will use this space to keep you guys updated. Hopefully I will be able to start shipping the magazine in a couple of months, just in time for the new games. Oh, btw, something I would like to ask you guys. We are going to have a session for letters and high scores (of Opcode published games), so please feel free to submit yours. You can use the letter session to submit questions, suggestions, comments, games you would like to see, games you are looking for, or even share tricks and tips (all related to Opcode). High scores should be submitted with pictures, please. I was tempted to make it paper letter only, like the good old days (so that I can justify the $100 I pay for the Opcode Club P.O. Box), but I guess that would be just too much. Hello, Opcode! It's been a long time! So long, in fact, I had to create a new account, or wait about ten weeks before my old one would work again...nice to know this netbook can still handle it; Opera Mini 5 is so good. Funny thing- my first post here was to inquire about the club, since I haven't heard anything about it- and here is an update! I'm still looking forward to it, and any new games for the CV. It has been too long, but 2012 was a rotten year. Can we submit games information we are working on? Glad to hear you are back. In fact I was wondering the other day what had happened to you. Originally I had planned to cover the whole homebrew scene, but since then things changed a bit. I won't be doing any more outsourcing work for the foreseeable future, which means I will be publishing my own games again. Add to that the fact the club structure is very expensive and I will probably doing it at a loss, and I will be the one paying for that, and you should understand why the magazine is Opcode only. 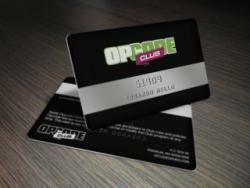 Opcode Club is an club in the same molds as the clubs companies like Atari and Coleco had back in the day. As a member you get a cool membership card, a welcome letter and a subscription of the Opcode Experience, the official biannual Opcode Club magazine. As usual everything will be professionally printed, which means, offset printing. Membership card is a cool credit card like card. In addition to that, as a member you will be able to enjoy special offers and exclusive items, TBA. Also, there will be a reward program, and if you got the SGM, that means you already have "credits" in your club account. I would love to join the club! Awesome! I'm glad to see this idea finally coming to fruition. I'll definitely subscribe! Plans are to have Club, SGM 2nd run, Goonies and Ghostbusters all released around August. Didn't we apply for the club already? Thought i did that about six months ago. It's only been 5 days! It's difficult to meet that demand when people are so busy around here. Also, forum members are used to a slow pace for homebrew productions. Maybe we could rally the troops for some support? I can think of some questions to send in. I'll see what I can do. What? There's something wrong with your e-mail accounts, Eduardo. I sent you an e-mail about registration to both e-mail addresses. I was expecting an e-mail saying at least "you're now in our files" , possibly adding "and we will be watching you"
Edited by nanochess, Tue May 14, 2013 7:09 AM. I want some of this action too. Indeed, I emailed you for your address to return that item you asked me for and I haven't heard back from you. But I'm not going to lose any more ground. Yes, I want to join this club. And if my finances improve (a big if around here), I'll buy the SGM. But we'll have to see. Do you plan on any remakes for the CV, like Mr. Do!, Space Fury, and Victory? Yes, I thought so too. Eduardo, what do we have to do to get in on the club? If we bought an SGM does that mean we are in already? If not, is there an additional cost associated with this? I don't know how to link another topic but if you go 3/4 of the way down in this Opcode games folder there is a topic called Opcode club. That one will tell you how to sign up, what it is about, and the possible charge that will exist to be in the club. It's been four years. I think it was long forgotten.